3) Go to '' Preferences ''> "Security"
4) Mark the option "Allow Plug-ins"
5) Click on Plug-in Settings. 6) Mark the option Silverlight. 7) On the right window, look for the website uk.rakuten.tv and change the status from Off to On. 8) Restart your browser and try to play content. Alternatively use another browser such as Google Chrome, Microsoft Edge or Mozilla Firefox, those do not require Microsoft Silverlight. 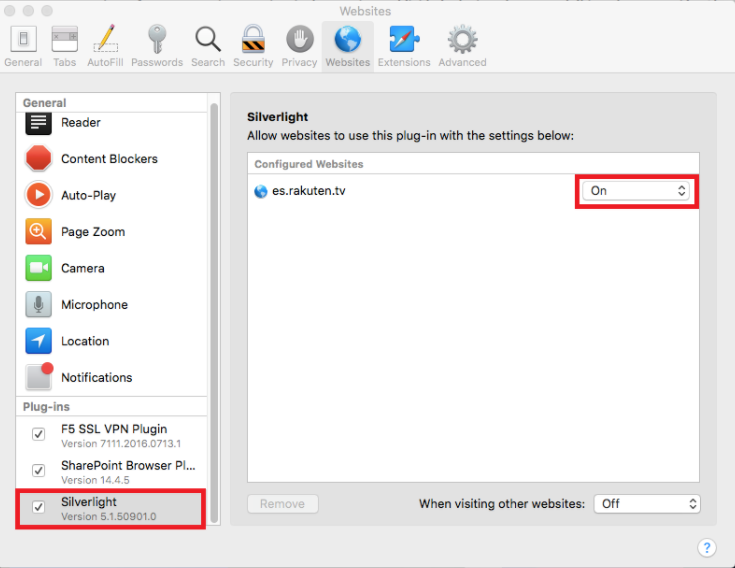 4) In the Plug-ins section, select the Silverlight option. 5) On the right window, look for the website uk.rakuten.tv and change the status from Off to On. 6) Reset your browser (quit and launch it again) and try again. Please not that it is not possible to play HD content from Safari for MAC, but dot worry, your content will still be played is Standard definition.